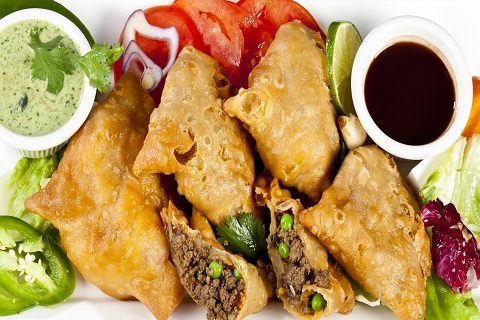 The ever-popular samosas make a wonderful treat on any occasion in India; they are a familiar sight at wedding receptions and cocktail parties. First make the pastry by making dough of the flour, butter, salt using warm water. Second make a dry fry of the meat. In a kadai heat the oil, add chopped onions, garlic, ginger, green chillies, ground masala, chilli powder and dessicated coconut. When the raw smell goes add the frozen peas and the meat and cook until the mixture is dry. Cool the mixture. Now divide the dough into small balls the size of a small lime, roll it out in a circle and cut in half, shape the half circle into a cone andthen place a large spoon of the cooled filling into it. Seal the edges and keep it a plate. Make all the samosas in this manner. Heat oil in a kadai and when the oil is smoking hot slip in the samosas three or four at a time and fry until golden brown. Remove from oil and drain excess oil on kitchen paper and arrange in a flat dish and serve hot with mint chutney or tomato sauce.